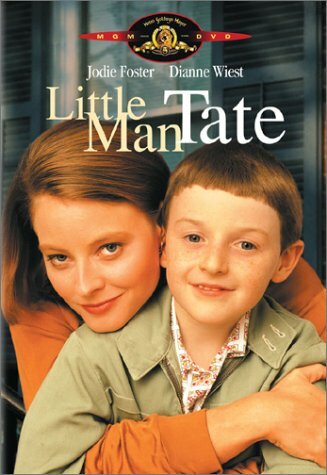 Starring Jodie Foster, Diane Wiest, Adam Hann-Byrd, David Hyde Pierce, Debi Mazar, Harry Connick Jr.
Jodie Foster makes her film directorial debut with "Little Man Tate," a superb film that is finely crafted and expertly told through its story and style. The movie finds little Fred Tate (Adam Hann-Byrd), a child genius who is bored with his school work, picked on by others and feels very lonely and depressed. Young Fred is a master of the piano, an incredible artist and can instantly understand and answer questions relating to math and science. Fred is soon caught in a tug-of-war battle of sorts between his mother, Dede (Foster herself) and a psychologist named Jane (Diane Wiest). Dede fails to really realize what Fred has and doesn't do much to expand his talents, while Jane wants to push him forward and give him the best of his mind. However, in this character study, we soon come to realize that Fred doesn't care of what may lie ahead of him and what he can do with his mind, all that Fred wants is to be happy and have friends. There is just so much to this movie, I can seriously go on and on about it as it does features so much. I am a sucker for these kinds of films, and if as I mentioned in past reviews, I really enjoy them no matter how good or bad they are. I really like what they bring with them and I basically eat them up, I really become engrossed and involved. Not all of them succeed on all levels, but when they are so well throught out, crafted and made I enjoy them tremendously and seriously find myself watching them over and over again. With its true themes, its strong messages and its well-developed characters, "Little Man Tate" accomplishes so much that so many other films try to and strive to be but never will be in the long run. There is a lot to cover and I can just rave on and on, so I suppose I'll start where it begins, that being with Scott Frank's extrodinary script. He creates quite a story that is filled with rich characters, marvelous dialogue and a story that doesn't go over the top and rings with much truth. It's amazing how this story creates tension by implying it of sorts. Sure, we do see it between Dede and Jane emotionally through their words and actions, but there's a good focus on Fred being caught in all of this. Fred struggles emotionally. Fred really does not care about his mental status or what he can do, he wants to be normal. He doesn't want to be alone or special. All that Fred wants is a friend and for people to like him. Still, the conflict that Dede and Jane has shows Jane pulling Fred along for exploitment and to take advantage of his mind, while Dede doesn't really understand and wants a normality to him. Still, in the movie Fred learns to find himself. The film has a great structure, necessary characters no matter how small or big their roles are and finally, just a lot of great themes and morals in it all. I mentioned that this was Jodie Foster's directorial debut, and she certainly does a wonderful job with this film taking Frank's script and developing it to the absolute core. She sets the film at a great pace so it moves fast and appropriatley, she really knows how to take a movie like this and set it up. She approaches the film carefully and really takes advantage of what it has to offer. She has a nice style visually too, and again, really knows how to work this movie. Her directing skills are mighty impressive, and she's just as talented off camera as she is on. Foster also tops the movie off with good editing, a fine jazzy score from Mark Isham and her own personal human touches. Another thing which makes the movie fly is the acting. Whatever happened to Adam Hann-Byrd? His performance in this movie is really nice and perfectly fits the role of brilliant, introverted Fred. He has a nice quality to him making him shy and normal at the same time. He has good delivery and delivers a strong performance. Same thing for Foster as Dede. She puts on an accent and really digs deep into the somewhat apathetic mother. Diane Wiest also digs deep into Jane as well, also finding the core as a person who sees so much in Fred and wants to move him along despite his mother. A young David Hyde Pierece and Harry Conick Jr. also put in equally effective and strong performance. Conick is great as the college student who Fred looks up to. He may seem clichéd as a character at first, but we come to realize there is more in him. No one could ask for a finer and moving cast. "Little Man Tate" is a must see film. Foster's directorial debut is amazing, and the performances she gets are just as good. Scott Frank creates a marvelous script with meaning, and it has nice touches of humor with effecting drama. Everyone owes themselves to see this film at once, more if you're Foster or drama fans. This DVD is superb, so don't miss it! I believe this is the first time "Little Man Tate" has been presented in widescreen since its original theatrical release, and this 1.85:1 anamorphic widescreen transfer looks pretty spiffy. Some blemishes pop up here and there, but those are rare and aren't distracting. Colors and fleshtones are finely saturated while black levels are pretty good too. Noise and shimmering comes up here and there, but it's nothing too major and never lasts for long. There is some grain to the image, and sometimes it looks a bit soft. Detail is also pretty good. Overall, this transfer is very good for what it is, and no one should be really disappointment. It could have been far worse, but looks up to far and is a mighty fine transfer in the end. The movie also has a 5.1 Dolby Digital track in English, as well as French and Spanish Stereo Surround tracks. The 5.1 track won't blow your speakers away, but they certainly fit fine within the movie's material and context. The jazzy score from Mark Isham sounds very nice through the speakers, while other jazz music and the classical music also sound nice. Surrounds are somewhat limited, as this movie is really dialogue driven, but when there are surrounds, they do sound quite nice (traffic outside, the schoolyard). Dialogue is clear and crisp as other sounds don't get in the way of it, there is an even balance between things. Bass extension is limited, but when used it sounds particuarly good. Overall, this is a good 5.1 remix that takes advantage of what it has. You may not think this movie is really 5.1, but I was surprised what was done with the sound in this track. It doesn't go over the top and creates a pretty believable envrionment for the movie. English closed captions, Spanish subtitles and French subtitles are also on this release. I was really thrilled to have an Audio Commentary with Jodie Foster, and it's quite simply one of the best audio commentaries I've had the pleasure of hearing. Yes, it's that good. I was hoping she'd contribute her thoughts on this movie rather than just have a boring old trailer, but yes, she's here to give her thoughts ten years later and that makes me very happy. Foster talks about how the script did change drastically over a good period of time, I had no idea that this was originally concieved as a black comedy. Foster is really talkative, even right through the credits and covers so much about the production. Foster is incredibly enthusiastic as she talks about her experiences as a first time director, her thoughts about it, directors in general and really talks about truths when making films, she really talks to you like it is. Foster praises her cast (even offering apologies to Diane Wiest) and aspects of the production. She also makes great comments about the themes of the film, symbolisms and characters too. In this commentary, she talks to you like she knows you. She is never bored or makes dull comments, she's fun and she really knows what she's talking about, she's really well prepared and confident. She's a joy to listen to, and this is really how all commentaries should be. In fact, I'd go as far and call it a "reference commentary." I was certainly impressed as this commentary far exceeded my expectations. Foster seemed to enjoy making this film tremendously, and we can hear her joy and warmth in this track. DO NOT MISS THIS. And of course, you also got the Theatrical Trailer in two channel sound and full frame. "Little Man Tate" is an extradoniary, one-of-a-kind movie that they simply don't make anymore. Foster's directorial debut is an impressive one, as she tells an incredible story with a great cast. This DVD has a nice price, a good presentation and a fantastic commentary with Foster. Don't miss it!